Keep Walking - Is Coffee Tourism Possible in Ethiopia? 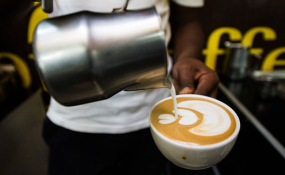 Addis Ababa — Two companies that deal in coffee have come together to tackle the problem of export unprocessed coffee in Ethiopia by creating a blockchain. "The French don't export grapes they export a branded bottle of Moscato," said Shane Reilly, co-founder of Moyee. "This shouldn't be any different for coffee growing countries like Ethiopia and Uganda. Blockchain removes the middle man and encourages trust because consumers know exactly what they are drinking, and where it has come from." Bext 360 is working with a company called Moyee to tackle this problem through blockchain. By creating transparency, customers can enjoy coffee with peace of mind. Ethiopia earned a record $866 million from coffee in the last fiscal year. However, the supply chain is still very murky and farmers are not being paid what they deserve. If coffee was roasted, packaged and branded inland, Ethiopia would have made $2.7 billion. After a process known as hulling, the majority of beans are exported to Europe by freight. Moyee have a roastery in Addis Ababa itself with local employees and this will be a game changer because 99.9% of coffee is roasted in Europe. Bext 360 has created a platform on which transactions can be monitored in real time. They are working with a washing station in the Jimma Region of Oromia where farmers take their cherries to sell. It is here the chain begins. Photos of each farmer are available online, along with information about how many kilos they have brought to the station, what the market price is and what they are being paid. As cherries travel through the coffee supply chain they are assigned crypto tokens, these tokens eventually show the full value added from bean to barista. As coffee continues through its lifecycle, a new token is created at each stage to represent the commodity in its new form. The blockchain, or fairchane as its known, records everything from payments to freighting to pricing to roasting. Farmers are paid a 20% premium by Moyee which is a good start towards giving them a liveable wage. "This is the next big step in a coffee revolution," said Guido van Staveren, Moyee Coffee co-founder. "Our platform changes things entirely. Crypto tokens enable us to pay farmers immediately and directly. Smart technology is being used to benefit the men and women who produce our coffee." A blockchain is a continuously growing list of records which are linked and secured using cryptography. By design, a blockchain is inherently resistant to modification of data. Once recorded, the data in any given block cannot be altered retroactively without the alteration of all subsequent blocks. Bext360 and Moyee are using a blockchain built by ¬Stellar, a financial tech startup founded by Jed McCaleb. Unlike the hiccuping Bitcoin network, Stellar was built to handle a high volume of cross-border micropayments. "The Stellar blockchain is a way to compensate farmers more fairly for what they actually produce," said McCaleb. "Coffee cultivators load their daily haul, usually about 30 kilograms, into a machine equipped with sensors and optical recognition tech that sifts and sorts coffee cherries. This automated appraiser assigns each a grade based on quality (bigger and riper is generally better). The machine then links this output to special crypto tokens tracking the produce across its journey." Starbucks have also announced it is launching a pilot program to incorporate blockchain technology, or "traceability technology" as the company put it, into its coffee supply chain. The experiment will involve select producers in Costa Rica, Colombia and Rwanda over an initial two-year period. In 2006 Oxfam accused Starbucks of denying Ethiopian coffee farmers wages so it is a good move. "Over the next two years we will look to demonstrate how technology and innovative data platforms can give coffee farmers more financial empowerment," Starbucks CEO Kevin Johnson said in a recent announcement. "These new digital tools have the potential to connect growers more openly and directly than ever." Coffee production in Ethiopia is a longstanding tradition which dates back many centuries. The country accounts for around 3% of the global market. 20 million rely on it for their livelihood. Only about 15% of the value in a bag of beans goes back to Ethiopia. As a commodity the price of coffee is increasing but at the same time the amount going to developing countries has been squeezed. Moyee have an increasing client base and recently signed a contract with Groupon. The company drink enough cups of coffee a year to support 2,300 farmers in Ethiopia. At a time where big organisations are putting so much emphasis on sustainability and fair business, socially responsible products are in demand. With blockchain, that responsibility can be monitored in real time and transparently. Read the original article on EA Business. Copyright © 2018 East African Business Week. All rights reserved. Distributed by AllAfrica Global Media (allAfrica.com). To contact the copyright holder directly for corrections — or for permission to republish or make other authorized use of this material, click here.